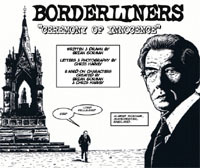 More comic news is that "Borderliners", a new comic published by Unico Comics, written & drawn by artist Brian Gorman, has garnered some great reviews from industry professionals. The story is heavily influenced by the 60s ITC action series, and particularly "The Prisoner". The 'Pilot Issue' can be ordered HERE, and was recently chosen as 'Pick Of The Month' by the UK Indie comics website www.smallzone.co.uk. The pilot issue features the likeness of Sir Ian McKellen as a No.2 type figure, and Issue 1 proper, which should be ready for the May Bristol Comics Con, will feature a heavy Prisoner tribute style story, and also have the permission of Sir Roger Moore to include his likeness as a leading character. With thanks to Brian Gorman for this news item.